1 part finely ground myrrh. (see my post-How to grind Frankincense, Myrrh and other Oleoresins, for tips on grinding.) The finer you grind the Myrrh, the more readily it will dissolve in the alcohol. I often grind Myrrh 3 times to produce the finest possible powder. 3 parts 45% AKA 90 Proof grain alcohol or unflavoured Vodka. Brandy, Whiskey or Scotch are also acceptable solvents for your tincture as long as they are at least 45% and unflavoured. Higher proof alcohol is also an option if you have it. A mason jar with a tight-fitting lid. Mix the powdered Myrrh and the alcohol in the mason jar. Make sure to break up any lumps. Screw the lid on tight, (moisten your finger slightly with vegetable oil and run it around the thread on the outside of the glass before you screw the lid on tight. This will prevent the resins from “gluing” the lid closed if some of your tincture gets on the thread). Place the jar in a warm place out of direct sunlight. The top of a fridge, furnace or water heater all work well. Shake your jar vigorously at least once a day for 6 weeks. Letting it sit longer will not harm the tincture. After your maceration is done, filter your tincture into a clean jar or bottle that has a tight-fitting lid or cork. You can do this by pouring it through a paper coffee filter in a funnel. Scrape all the ground Myrrh into the filter. If you like you can try to press the rest of the liquid from the material, but be careful the paper doesn’t rip. Seal the jar or bottle and let your tincture stand undisturbed and sediment for a few days. Pour or syphon off the clear liquid and bottle it for use. It can keep for a few years in a cool dark place. For sore, spongy or inflamed gums, loose teeth, Canker sores, toothache, Gingivitis, Halitosis, sore throat, or Thrush, mix 1 teaspoon of your tincture in a cup of warm water in which you have dissolved 1/4-1/2 teaspoon sea salt. Swoosh some around in your mouth for as long as you can, (spit it out when done), and do this as often as you can through the day. Continue using this tincture and mouthwash as a daily preventative. —-A rudimentary, but effective tincture can also be made by adding 4-5 drops of essential oil of Myrrh to a teaspoon of an alcohol/water mix like such as vodka. This can be added, as above, to a warm mix of water and salt. If your distress is persistent, or there are obvious chronic problems that need to be addressed, it is best to make arrangements to see a qualified healthcare practitioner and do what needs to be done. Why not just apply myrhh oil to the gums? Also, I have some tincture of myrhh & benzoin and wondering how it is used and more about it. Thank you. Hi. Though I don’t recommend using essential oils “neat”, some people do apply a drop of essential oil of Myrrh on a Q-Tip to sore spots. It is more concentrated, so be cautious of any symptoms of irritation. In my experience the essential oil is not absorbed by the mucous membranes as readily as the salt water solution. 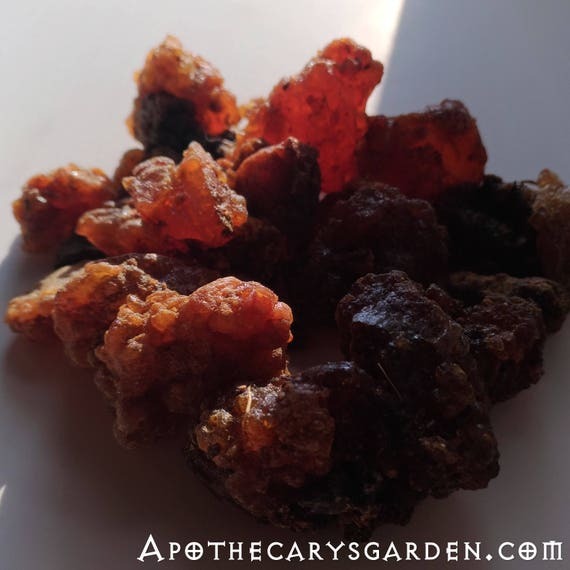 The essential oil of Myrrh can also be diluted in alcohol at up to a ratio of 1:50 and added to warm salted water in the same way as the tincture for a mouthwash. A tincture of Myrrh and Benzoin should work in much the same way as a tincture of Myrrh for oral care. Hi, thanks so much for your information. Are any of the beneficial properties lost when purchasing a ground oleoresin? Is it best for me to grind it myself? Though some essential oil escapes when the resin is powdered, it is not significant. My concern with buying powdered resin from supply houses and retailers is that you never know exactly what you are getting. Often material that is old, low quality or the siftings from the bottom of the bag can be powdered to make them sellable. Even retailers can’t really tell what is in the powder they purchase from brokers. For this reason I prefer to grind resins myself knowing I have a high quality and fresh material. 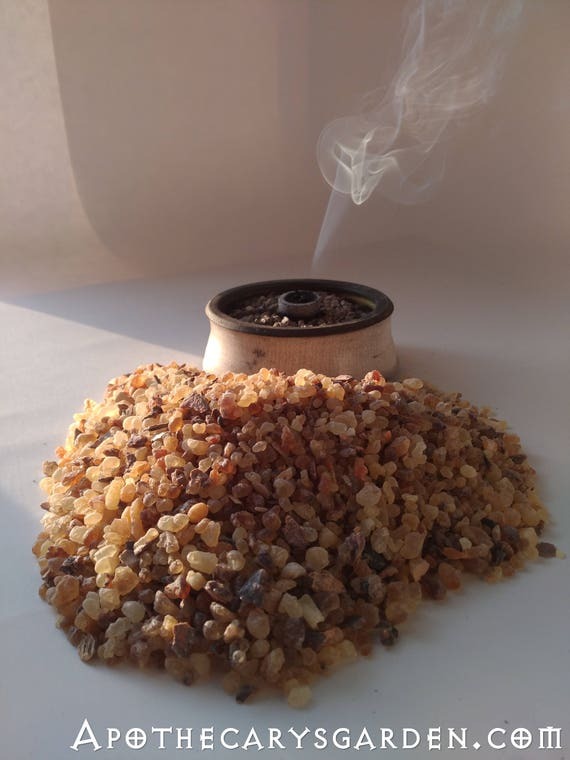 There are instructions on this blog for grinding Frankincense and other resins and I sell powdered resins I grind fresh from high quality material in my shop. It seems like alcohol would destroy the medicinal properties of the myrrh…. Hi, was wondering if Myrrh essential oil can be used to make a tincture, or does it have to be powered Myrrh? You can definitely dissolve Myrrh essential oil in alcohol and make a tincture of it for a mouthwash. My first choice is a tincture of the whole oleo gum resin in alcohol, but the essential oil is also effective for many oral issues. What a lovely website you have. I came across it while researching how to tincture resins. One question: you mention above that you *can* use a higher-proof alcohol, but I wonder if this would be beneficial. 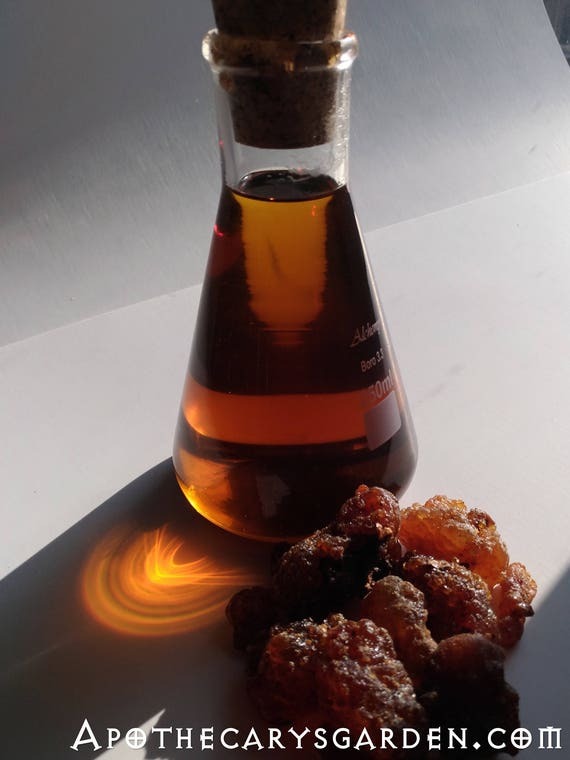 Do you have any opinion of what the optimum alcohol percentage is for making tincture of myrrh? Or factors to consider? I suppose the water is able to extract some properties and the alcohol others? Hi, when making the mouthwash using the tincture, how quickly should that be used up before someone should worry about it not being preserved to prevent bacteria growth? The mouthwash can safely stay at room temperature for a day, kept in the fridge for 6 days and be frozen for 6 months. If desired, a large batch can be poured into ice cube trays and warmed for use, one cube at a time. Hi Sandy. I don’t see why not. It still has valuable therapeutic compounds in it. You will have to lay it out in a thin layer to dry and you may have to freeze the dry residue before you can easily grind it to a powder. Hi. You could try 5-10 drops 2-3 times a day and see if it is of help. Frankincense has good anti-inflammatory properties, and inflammation is often linked to pain. You could also consider trying the tincture of Frankincense at the same dose, or taking 1/2 to 1 level teaspoon of powdered Frankincense with food 2-3 times a day. Taking it with oily food is recommended to promote absorption by the body. Thank you for all the information you have on your site. A quick search brought me here to make sure I was doing my tincture correctly. I have been using a fairly expensive myrrh extract for a tooth/gum problem and am trying my hand at a tincture. I’m using ground myrrh and Everclear (190 proof grain alcohol). After three days a small sample seemed to be coming along very well. You are in my bookmarks and I’m sure I will be checking back. Sounds like you are on the right path Bill! Let me know if you have any questions along the way.